Starbucks is more than just a job. Partners are truly at the heart of our success and at Starbucks Canada we proudly support the careers of more than 18,000 full and part time partners (employees). Check out the stories below to hear what it’s like to be a partner, from our partners. “Other than working 40 hours a week, I train for triathlon all summer, I play hockey, I’m in a band. I think that just the nature of working for Starbucks is that things are constantly changing and moving and you’re very flexible. We’re not 9 to 5, we don’t sit at a desk, we don’t work Monday to Friday - so you have the opportunity to move your life in with your work. 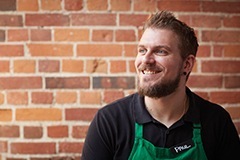 It’s a great company to work for.” Learn more about retail careers like Paul’s. 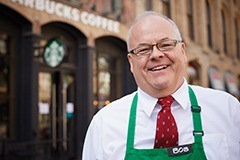 “Starbucks is a great job as a retirement job because you stay energized, you connect with people, you’re part of a big family. They have an awesome benefit package, and at my age, that’s extremely important. I would encourage anybody in retirement who wants something to do to look at the Starbucks family – its invigorating. It’s an awesome retirement job.” Learn more about retail careers like Bob’s. “I’ve got dental, I’ve got eye care, I’ve got my stock options; I’ve got it all! Starbucks just gives you stock for working at Starbucks and then you can cash it out, and then that’s just money for you – I used mine to go on vacation last year. I’ve made some really good friends, I have a knitting club – we’re all baristas that knit. I met my boyfriend at Starbucks…coffee brings people together.”Learn more about retail careers like Maisha’s. Want to see more of what life is like as a partner at Starbucks? Search for the hashtag #tobeapartner.